on pelvis, skull or femur. will disturb their sleep or mine. 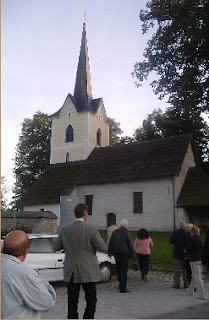 This was written after a visit to a small church in Slovenj Gradec, Slovenia where archaeological remains including graves, skeletal remains and grave goods were left in situ by archaeologists and covered by a glass floor in the church. Some information here and here and here. The town was also the birthplace of composer Hugo Wolf. The poem was published in Revival September 2007.
being able to read three books at the same time. 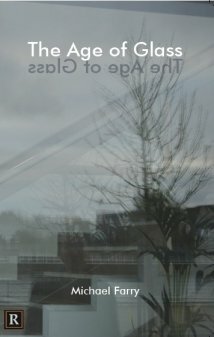 A first poetry collection by Scottish poet, Andrew Philip, The Ambulance Box. I met him at the Arvon course two years ago. He blogs here. I'm two thirds of the way through The Rabbit Omnibus by John Updike who died recently. Three of the Rabbit novels in this collection, Rabbit, Run; Rabbit Redux and Rabbit Is Rich. The other novels in the series are Rabbit At Rest; and Rabbit Remembered. And just in case I was enjoying myself too much Meter, rhythm and verse form by Philip Hobsbaum. A concise but comprehensive survey. So I'll be able to say exactly what an amphibrach is. In our writers group it has almost become a joke that when someone reads a poem or a story we automatically advise them to leave out the first stanza or the first paragraph. This usually improves the piece. The instinct is to write an introduction but it's much better for the reader to be thrown in medias res as the Latin has it. In the spring 2009 issue of The Stinging Fly poet Colette Bryce, writing about first drafts, expresses this so much better: "The big front door - my original opening- will have been necessary for leading me into the poem, but once in, I no longer need it. I like the reader to arrive in the room, the 'stanza', as if by magic. No doorbell". This is part of a special magazine feature on First Drafts by six writers each of whom takes a different view. One of the writers is Irish poet and short story writer Nuala Ní Chonchúir who blogs here. Colette Bryce reads and gives a workshop at the Poetry Now festival in Dun Laoghaire at the end of March. Her latest collection, Self Portrait in the Dark, is reviewed in this issue of The Stinging Fly. from Ash Wednesday by T S Eliot. Read the full poem here. A Wikipedia article on the poem here. 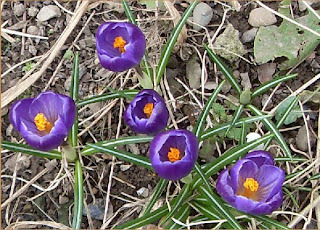 An Ash Wednesday poem by John Keble (1792 - 1866) here. Just got the winter 2008 Poetry Review the UK Poetry Society publication. As with other similar magazines I enjoy the articles and reviews as much as the poems. It does have three poems from Ruth Padel's book of poem on Darwin which I wrote about on Friday. There is a link on the website to some (very little in fact) free sample content. However it does contain an article from a three article feature in the magazine called The ghost in the machine which deals with the relationship between poetry and religion. You can read Poetry In A Post-Secular Age by poet Michael Symmons Roberts here. He speaks of the changes in recent times, "Christianity and Islam are growing very rapidly throughout the developing world, and a recent report placed the numbers of atheists worldwide at three per cent and falling"; "in the last few years a number of philosophers and sociologists have coined the term post secular to describe our current condition." Another article is by Christian Wyman US poet and editor of Poetry magazine. He suggests that poetry can at times reveal not the extraordinary within the ordinary but the reality which is larger and more complex than we are able to percieve. He ends by disagreeing fundamentally with Yeats' choosing "perfection of the life, or of the work" - "these things - art and life, or thought and life - are utterly, fatally, and sometimes savingly entwined". The danger when writing about religion and poetry or religion in poetry is ending up saying something essentially meaningless like "Poetry is religion" or "Religion is poetry" on the basis that poetry looks beyond the ordinary. This won't do I think. You could say the same thing about prose and art. There has always been a difficulty with anthologies of "Religious poetry", the various titles reveal the problems - The Penguin Book of Religious Verse, The New Oxford Book of Christian Verse; American Religious Poems: An Anthology; Oxford Book of English Mystical Verse; The Poetry of Piety, an Annotated Anthology of Christian Poetry etc. Roberts says he has been asked to compile an anthology but is waiting to find a suitable title. most American religious poetry is devout most British religious poetry is not about doctrine but about a hope. The magazine also contains a review of the third book of poetry, Headwaters, by the Archbishop of Canterbury Rowan Williams. Does the world need another sycamore poem? Probably not and certainly not if it's much the same as most of the others. Still the coffin idea may be original so I'll stick at it. William Carlos Williams wrote about a young sycamore. Read it here. Another American poet on sycamores here. 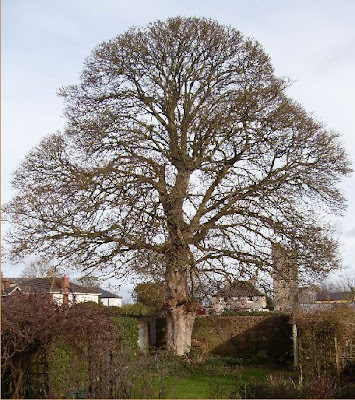 Of course the sycamore tree can mean different things in different places, the Irish sycamore is not the same as the American sycamore. More here and here. To avoid confusion I'll call my poem Acer pseudoplatanus. That's the correct name and I like the resonance of the pseudo also. 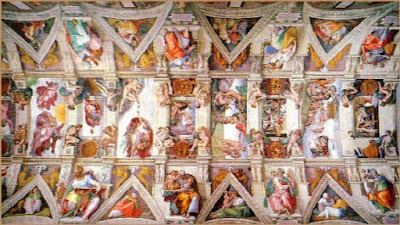 from Michelangelo's Poem: On the Painting of the Sistine Chapel. I know how he felt. I've just finished the second coat of paint on the kitchen ceiling. Thankfully with modern ceiling paint there are fewer brush drops to bedew the face. The colour is white, brilliant white as it says on the tin, not angels or hands touching hands just plain white. Someone gave me great advice about painting once he said "Always paint away from the light" or was it "towards the light" I forget. I just get lost on the ceiling, miss bits, paint different parts in different directions then have difficulty figuring out which bits I've painted, which bits have not been painted and which bits have been but have dried. Remember these great lines by Franz Liebkind in The Producers: "Churchill! With his cigars, with his brandy. And his ROTTEN painting! Rotten! Hitler, THERE was a painter! He could paint an entire apartment in one afternoon! TWO COATS!" Poetry while painting? Hardly though there is a great view of my sycamore tree from the kitchen window. I began to wonder if it could be used to make a coffin, mine actually. Not immediately you understand but whenever. Wouldn't it be nice to bring some of the tree with me. Then I began to think of coffins I have helped to carry. I must look up sycamore wood on the internet. Well you do need some light relief when painting ceilings. Wonder what Michelangelo thought about day after day. Sistine Chapel here. More on Michelangelo here. it was already early March. watching them sink through snow. snow melts but ashes stay. This is actually a poem for Ash Wednesday - next Wednesday. It was written in April 2006. There had been a small fall of snow on or near Ash Wednesday that year so I played with the image of snow and ashes. I remembered my father throwing out the ashes in the end of the garden on top of snow. The poem was printed in the UK magazine Carillon in April 2007. Charles Darwin was born 200 years ago this year and there have been many books and programmes to mark the anniversary. 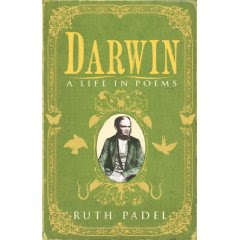 Poet Ruth Padel is a great-great- granddaughter of Darwin and has written a book of poetry about his life. Irish Times review by Irish poet Seán Lysaght here. Feature on the book here. Darwin: A Life in Poems is published by Chatto Windus at 12.99 in UK. Short interview with Ruth Padel and a reading from the book on the 12 February Nature podcast here. The latest issue of the US magazine Poetry just arrived. Always interesting sometimes delightful, this is one of the most enjoyable issues recently. The issue features a collection of eight manifestos commemorating the centennial of the Italian futurists' manifesto. In 1909 pamphlets were dropped over the town of Milan containing Marinetti’s Futurist Manifesto. These manifestos are a mix of the serious, the half-serious and the downright parodic. They all contain gems of contention or wisdom. All rhymed poetry must be rhyme-driven. This is no longer to be considered pejorative. Rhyme is at the wheel. No, rhyme is the engine. Rhyme frees the poet from what he wants to say. I love originality so much I keep copying it. Immature poets borrow. Mature poets invest. The magazine can be read online here. There is also a podcast here. Some enterprising internet user with too much time on his/her hands has designed a bus slogan generator site where you can put your own slogan on a bus. Thanks to bloggers Emerging Writer and Barbara who blogged it first. Sony Music had the same sort of idea to publicise Dylan last album. You could add your own message to the cards in the famous the "Subterranean Homesick Blues" cue-card scene from the film Don't Look Back by D.A. Pennebaker. That's poet Allen Ginsberg in the background by the way. Which reminds me that according to reports Dylan will release a new album in late April to coincide with his European tour. Great news. His last three albums have been widely praised as masterpieces. Read the rumours here, here and here. Were you at the cinema last night? What film did you see? Did it address any of the major issues of the day? 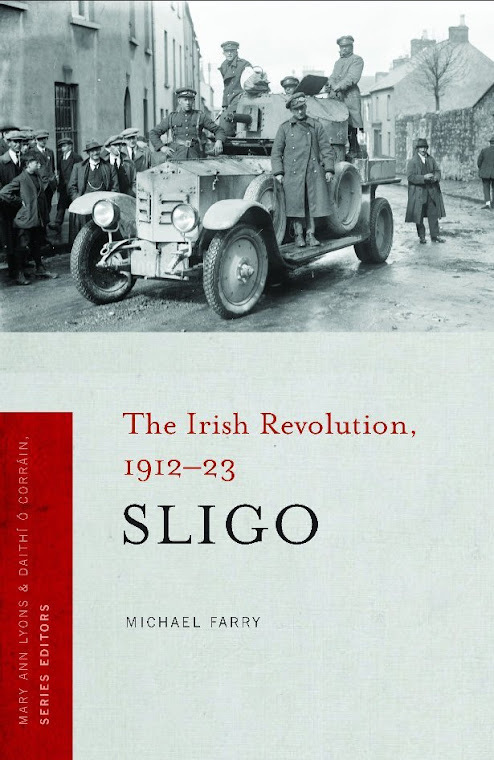 If you had gone to the Palace Cinema Sligo 90 years ago on 16 February 1919, a Sunday night, you would have seen The Labour Leader. This 1917 silent British drama features a Socialist labour activist John Webster whose consciousness is aroused when he meets an unmarried, pregnant laundress Nell Slade. Webster leaves his society sweetheart and becomes a political activist. He becomes the first-ever Labour Party member elected to Parliament. By his side at this triumph is Nell Slade, who has long since become his bride. 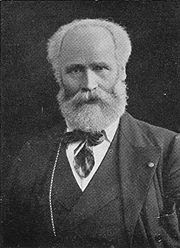 Picture: Keir Hardie one of two Labour candidates elected in the October 1900 General Election. More history here. The film is described as entertaining enough to please even those filmgoers who didn't agree with its political views. Fred Groves played the male lead and Fay Compton was also among the cast. She was to have a long acting career, one of her last major roles was as Aunt Ann in the BBC's 1967 television adaptation of The Forsyte Saga. As well as the feature you would have also seen episode one of a new eighteen part serial called The Mystery Ship. Each episode lasted twenty minutes. There was also a newsreel called Irish Events which was filmed and distributed by The General Film Company of Ireland headed by Norman Whitten. And you thought silent films were all slapstick and comedy! I spent some hours on Thursday, Friday and Saturday taking part in a charity bag-pack at Tesco, Navan for the charity Zest4Kidz. I chose the task of standing at the exit with the collection bucket actually collecting the money while others packed shopping for shoppers who in theory at least contributed money at the exit. Plenty of time to watch people and to think. It is actually a very positive experience because so many people give money. Many apologise as they contribute - "Sorry it's not more". There is no way of forecasting who will contribute and who won't, stereotypes of age, dress, gender etc count for nothing. As I noted the last time I blogged on this a common practice is for parents to give money to children to put in the bucket. This is somehow heart warming, something to do with wanting to pass on the giving attitude I suppose. And you meet interesting people. Most just contribute and keep going. Some pause and chat. I met a man who lived in East Africa for forty years. 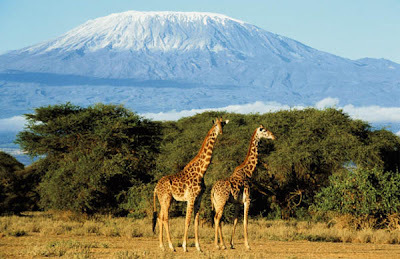 His children were born in the shade of Mount Kilimanjaro which he climbed in the late sixties. Much less snow on it nowadays. Another lady said "I was going to buy a bottle of wine but decided to give the money to the needy instead". In spite of recession the spirit of giving still appears to be strong. Items about the snow on Kilimanjaro here and here. Article "Recession Begins to Bite the Irish Charity Sector" here. 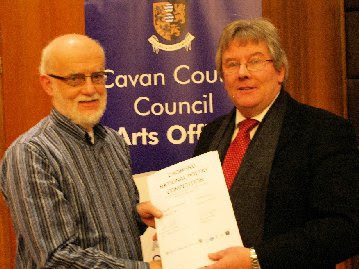 Just back from Cavan where I attended the presentation of awards for the Caomhnú competitions. A very enjoyable ceremony. 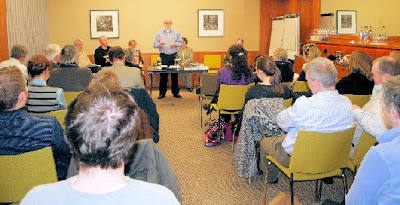 Presentations by the judges, Noel Monahan - poetry and Shane Connaughton - short stories. Above: Noel presenting me with my certificate. Caomhnú Crannóg Bookshop Short Story Competition. 1. Eddie Stack - Bobogue. 2. Joan Power - The Landlord. 3. Patricia Byrne - As It Was. Highly Commended: Eileen Condon- A Holy Terror; Eddie Stack - Granada and Me; Gloria Carretero - Red, Yellow and Ash; Declan Sweeney - A Silver Hammer. 1. Honor Duff - Hare's Breath. 2. Gavan Duffy - Violation. 3. Philip Quirke - Crab in a Rockpool. Highly Commended: Brendan Carey Kinane - Derrygimma; Tony O'Dwyer - Dream; Michael Farry - Asking for Directions; Patrick Devaney - Siskin; Betty Cleary - January Thoughts; Honor Duff - King Hawk; Barbara Smith - The Dairy Shed. Meath/Louth LitLab was well represented in the awards, Honor Duff, Patrick Devaney and myself are members. 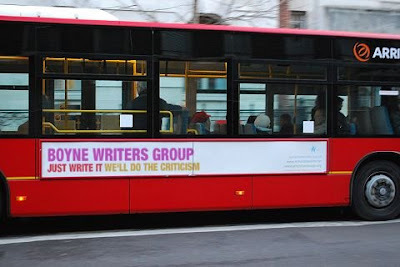 Boyne Writers Group were represented by Brendan Carey Kinane and myself. Nice also to meet Barbara Smith who blogs here. Thanks to Cavan Arts Office for the event and for the very enjoyable and appreciated lunch. This week's poem is "Consumption". It's on the Poetcasting website. Poetcasting is the brainchild of Alex Pryce, a 21-year-old poet and student of English from Northern Ireland. 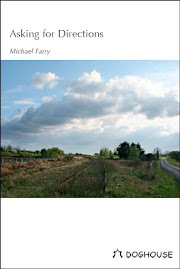 The site has audios - with short resumés and photos - of UK and Irish poets reading their work. I met Alex Pryce at an Arvon course in Yorkshire in 2007. I read Consumption here. The text is here. There is a nice mention of the poem here in an article on Poetcasting. This poem is part of a series of poems telling a story based in Sligo in the early 1920s. Beatrice, the heroine, is recounting the decline and death of her mother from TB or consumption. 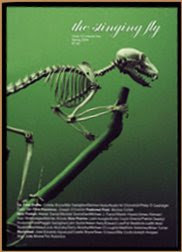 It was shortlisted for the Sligo Scríobh Poetry competition 2006 and published in the volume “Scríobh Poetry Competition 2004-2006” by the Model Arts and Niland Gallery Sligo. 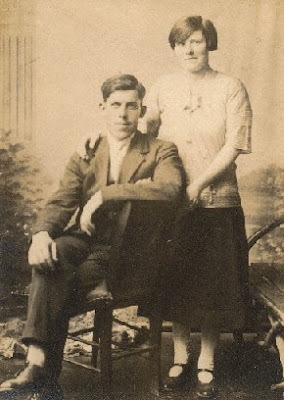 I'm using a picture of my grandparents Thomas Harrington (1898-1987) and Bridget Harrington (nee Gallagher) (1900-1932). They married in 1918 when he was twenty, she eighteen. Bridget died of TB in Cloonamahon sanatorium, Collooney on 15 August 1932 leaving a young family of two girls and four boys. One of those daughters, my aunt Margaret, is still alive in Sydney, Australia. 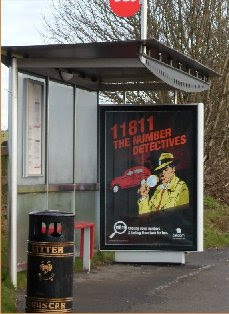 The poster at the Trim bus shelter advertising God's Direct Line (Tuesday 10 Feb post) has been replaced by another advertising the same service. This is more like advertising as we know it - bland, cliched, uninteresting, dispiriting - using images and references which are so overused and unimaginative that the use of the cliches in advertising is itself a cliche. The image is ridiculous without being amusing - the coat and hat from the first half of the last century with the glass which relates to the end of the century before last. And the car? No not in a bad mood today just dislike having to look at this rubbish. Just turn left and this is the scene. Ah that's better. Maybe this is God's direct line. Valentine's Day approaches and poetry websites seem compelled to offer poetry or advice on writing love poetry. At least the American ones do. Both www.poetryfoundation.org and www.poets.org have features relating to the day but the UK Poetry Society website has only a link to a press story. This may change before Saturday of course. Poetry Foundation has a feature called "Let’s Face It, Nobody in Love is Original" in which four poets, Adrian Blevins, Rebecca Hoogs, Cyrus Cassells, and Craig Arnold, discuss love poetry. They also give examples of their work. The best line in the article is by Adrian Blevins: "Poetry is not about how we feel, of course. It’s about how we feel about how we feel". Poets.org has a Love Poems page which includes Poetry Valentines allowing you to email or print illustrated excerpts from love poems. 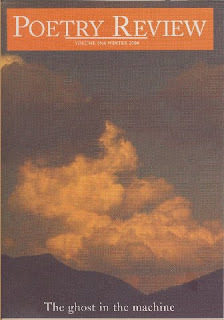 It also has full text of a number of love poems by well known and less well-known authors. So far the only related item on the UK Poetry Society website is the link to this story about most people preferring to say "I Luv U" by text rather than compose a romantic letter or poem to a loved one. The Poetry Ireland website has a notice about a reading of love poetry in Irish in Whitefriar St Carmelite Church, 56 Aungier St, Dublin 2 at 10.45am on 14 February just prior to 11.00am mass. The poetry will be read by Nuala Ní Dhomhnaill, Liam Ó Muirthile and Colm Breathnach with traditional love songs in Irish sung by Lorcán Mac Mathúna. The poems and songs come from the recently published anthology Filíocht Ghrá na Gaeilge/Love Poems in Irish, edited by Ciarán Mac Murchaidh and published by Cois Life. Whitefriar Street Church, Dublin is where the remains of St Valentine are kept. 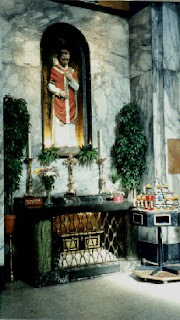 Picture of his shrine from this page where you can get the full story. I'm delighted to have a poem published in the current issue of the online WOW!Literary Magazine. This online magazine of poetry and prose is published by Wordsonthestreet in Galway. The poem is called Tomorrow and was written towards the end of last summer hence the mention of foxgloves and rain. My first instinct when looking at a poem of mine in print on paper or online is to wish that I had spent more time on it. This is especially true if the poem is in free verse, if it is in a received form then there is I think a more finished feel to it. Anyway I think this one works reasonably well. It's in good company. The magazine also has poems by well-known Irish poets Gréagóir Ó Dúill and Liam Aungier. 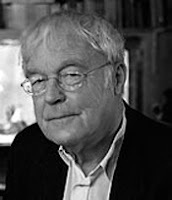 Wordsonthestreet is run by novelist and short story writer, Gerardine Burke and poet and fiction writer, Tony O'Dwyer. 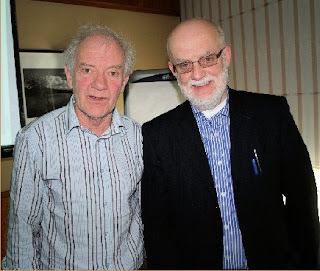 Both are also members of the editorial board of Crannóg Magazine since its foundation. This advertisement, pictured at a Trim bus stop, is interesting in light of the atheist advertisement on London buses which I wrote about on 18 January. It does say something about Ireland that a national telecom company can publish an advertisement like this without creating a fuss. I have a feeling that it might be more difficult in England. At least there is certainty in the Irish campaign instead of the weak London "probably no God" (They used capitals to avoid the problem of whether to capitalise the word "God" or not). If you ring the number given you hear a plummy RTE advertising accent makes a weak joke about the "second coming postponed due to cut-backs" and then have to listen to the ad for the 11811 directory service. The campaign appears to be a response to a current campaign for a rival directory service featuring impressions of Irish finance guru Eddie Hobbs. I understand there is another similar advertisement featuring Cupid's personal number, I wonder if it's the same number as God's. The advertisement featured in the LiveLine show at the end of last month, podcast here. There is also some discussion here. More about the atheist bus advertising here. in·spi·ra·tion (nsp-rshn) Definition from the free online dictionary. 1.a. Stimulation of the mind or emotions to a high level of feeling or activity. We had a lively discussion at our writers group recently about inspiration. I dislike the use of the word to denote sudden almost heaven-sent "creative" ideas popping in to the writer's mind from nowhere. I prefer the idea of the writer always on the prowl for subject matter whether this be words, pictures, remarks. In the end I don't think we are arguing about what happens only about how we describe what happens. I do think it is important though because the common interpretation of inspiration stresses the passivity of the writer, waiting blankly on the couch for the inspiration to strike. I prefer the active idea of the writer on the prowl for ideas and subject matter. At his drama workshop last Saturday in Cavan John McArdle started by asking each of us to write a random line of dialogue, no prompt no theme. We read them then and he wrote then in order on the chart. We were not allowed to change them or their order and spent a while making sense of them. At the end of the session we had the basis of a play. Each of us brought it in a different direction but all were based on the same few first lines. The point here as regards inspiration is that from the most unpromising random material great writing can emerge. Picture (by Paddy Smith) of myself and John McArdle last Saturday. I spent Saturday in Cavan at the Caomhnú Festival. This was well attended with all the workshops full or nearly full. I attended the Writing for Theatre Workshop with John McArdle. It's always interesting to experience the different approaches taken by workshop facilitators. John made us work and we ended up with the outline of a play each - not necessarily the same play. He started by getting a line from each of us and then trying to make dialogue of these lines. That led into consideration of what, who, where and when. A very enjoyable and useful workshop. Noel Monahan gave a poetry workshop which participants seem to enjoy. Part of this involved discussion of poems the participants brought to the session. The other workshop was Claire Keegan's one on the short story. Again a different approach seems to have been taken here. Participants really enjoyed her discussion of the approach to and process of writing a short story. All this made for great discussion and exchanges during the lunch and tea breaks. Our LitLab reading took place at 5pm. Seven of us read, a mixture of prose and poetry. I was asked to start and read two poems. It can be difficult to choose work for reading and I chose what I thought were accessible pieces that the audience would "get" without too much introduction. One was the "I Taught You How to Drive" poem which was a prizewinner at Dromineer last year. I felt both pieces went down well. (Picture above.) The LitLab reading were very well received by the audience and we got numerous compliments. The mixture of prose and poetry, seriousness and lighthearted went down well. The dinner followed and there were more reading and performances after that. A very full enjoyable day. Today's events, including the presentations of the competition awards has been postponed because of the snow. I wrote this poem after attending a reading in Dublin by Seamus Heaney and Dutch poet Rutger Kopland. Heaney spoke about memories and poetry and I remembered watching him on the Late Late Show in the late 60s reading as part of a young poets item. He read Mid-Term Break and my mother who as far as I knew had no particular interest in poetry said after he read "His little brother was killed in a car crash". Two brothers of mine had died in infancy and I wondered if mother was thinking of this as she heard the poem. The last line is from a poem by Kopland. Enjoying the snow when it comes without worrying about road conditions, getting to work, getting home, schools closing, not being able to go out etc. This was the worst snow we've seen since 1982. The worst snow of the last century in Ireland was that of 1947. 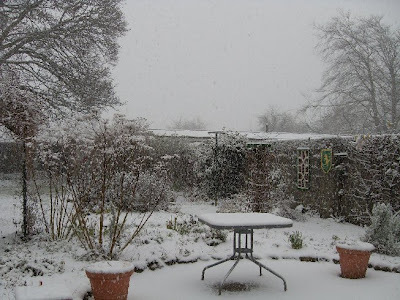 The blizzard started in February and people said that some of the snow still lay in sheltered spots until the end of May. This is what Patrick Kavanagh was referring to in Shancoduff though this was written before the 1947 blizzard. I was born in 1947, too late for the blizzard though. You can read interesting accounts of the 1947 blizzard in the west of Ireland here and here. The Plough Poetry competition based in Devon UK has just announced its results. This is, in my opinion, one of the best organised poetry competition I have come across. The main problem I have with such competitions is the difficulty in finding out the results. The Plough people email all entrants with a comprehensive report on the competition, all the results, short and long lists etc. Most of the same information is available on their website. In these days of electronic communication surely it's not too much to ask that all competitions do likewise for entrants who have supplied an email address. The Plough competition also accepts online entry which saves having to find a sterling method of paying fees. They also offered free check list critiques to all entries received early. Last year's competition attracted two and a half thousand entries. This was down slightly on the previous year. There were more entrants overall but the average number of poems entered by each was down. This they attribute to the recession/economic downturn or whatever it's being called at the moment. Below are two extracts from the report on the competition with pointers perhaps on what not to do if you want to be successful in a poetry competition. Fruit (mainly apples) was a recurrent theme in 2007, with angels closing on seagulls in the popular symbolism stakes. Perhaps unsurprisingly though, these and many other hugely popular subjects for poetry (bereavement, cats, the seasons) were eclipsed in the 2008 entry by what might be termed 'what is the world coming to?' poems. War, street crime, corrupt and uncaring government, failures of the system to look after the vulnerable - these were overwhelmingly popular subjects this year in poems often heavily laden with rhetorical questions, and a general feeling of hopelessness and doom made for some pretty depressing reading at times. Happy poems have always been in a minority, probably because without a leavening of sadness and a suggestion of impermanence they can seem rather bland --but the least depressing of the doom and gloom poems turned themselves around with messages of hope and empowerment, usually at the end. On the brighter side, there were fewer 'shards' about, and archaisms (O'er, thou, 'twas) were not as much in evidence as in previous years. Layouts were more conservative this year, compared with the explosion in regularly or irregularly indented layouts in 2007. Centred poems seem as popular as ever, and our free critiques always warn poets that judges and editors generally dislike them. Fewer poets are making extensive use of odd spacing within lines, and correctly used punctuation seems to have made a bit of a comeback - though exclamation marks are still overused (and brackets seem to have become inexplicably popular). Last year saw a dramatic increase in titles ending in question marks or enigmatic ellipses. That trend seems to have passed, though there were still some among the 2008 entry. The words Autumn (always popular), Granny/Grandad, last, old , waiting and of course the ubiquitous I cropped up a lot in titles this year, and there was a long list of titles beginning with Winter. Words, Time and Spring were the most popular one-word titles. Among the 'B's, there were a great many titles beginning with beneath, beyond, behind and below, and the poetic form most often named in a title was the sestina. If you're in any doubt about the importance of titles, have a look at the long and short lists and imagine that you are an editor needing just one more poem to fill a space in your magazine. Where would you start?" Cavan Caomhnú Literary Festival starts tomorrow evening. I've just heard that a poem of mine has been highly commended in the poetry competition. I'm always please to get noticed among the hundreds, and in some cases thousands of entries. I entered three poems and as often happens the poem commended was not the one I would have selected. I wrote it after a trip to Florence last year. I often find that in a foreign country I'm asked for directions and I'm really annoyed if I can't help. In Florence, though the person who asked spoke no English and I spoke no Italian, we understood each other and I pointed the way to the Ponte Vecchio. The poem dealt with this and the feeling of being at home in Florence and a visit to the church where Dante's great image of idealised love, Beatrice, is buried. All those elements are mixed up in the poem. Fellow Boyne Writers Group member, Brendan Carey Kinane also has a poem highly commended in the competition. I'm also reading at the festival with other members of the Meath/Cavan Arts Offices LitLab project. Full details are here. A very interesting programme including talks, workshops and readings by Joseph O'Connor, Noel Monahan, Iain Archer, Snow Patrol, Michael Harding, Billy Roche and others. Michael Harding is a Cavan-born dramatist and novelist who currently writes a column for the Irish Times called Displaced in Mullingar. You can read a recent column here. See you in Cavan over the week-end. 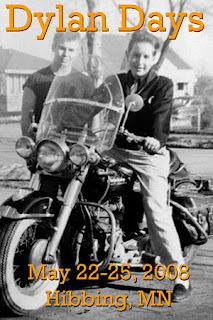 The Dylan Days Festival in Hibbing, Minnesota, USA has issued its 2009 call for entries for its Creative Writing contests. The annual contest based in Bob Dylan's hometown includes poetry, short fiction and one-act play categories. The deadline is March 15, 2009. Poetry and short fiction will be accepted through an online entry system but one act plays are accepted only through the post. Full details here. "Content and subject matter are completely open, but should reflect what Bob Dylan came to be known for - an original voice who embraced a new direction, a unique vision with the power to move people." Dylan has just allowed one of his songs be used in an advert which was aired for the first time during the Super Bowl last Sunday. This is not the first time he has allowed a song of his be used. Most famously his "Love Sick" was used in a commercial for Victoria's Secret lingerie. Hushing the latest traffic of the drowsy town;"
London Snow by Robert Bridges. 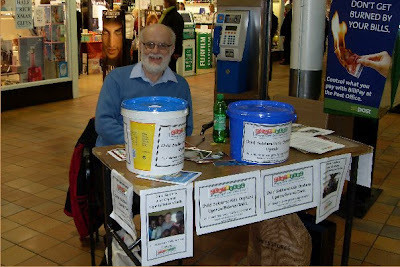 Five hours yesterday sitting behind a table in Navan Shopping Centre collecting for a charity, Zest4Kids. Once you decide to enjoy it it's actually fun. I opted not to read a book, the newspapers or listen to my iPod because you have to look interested and be prepared to talk to anyone who asks questions. You do have a great opportunity to just observe people. Lots of people just pass by as if you weren't there, others read the posters, move on, open purses and come back and drop some coins or even a note in. Some few ask questions or make comments. People who know you either come up with a greeting and a chat or don't see you and move on. When I looked at the photograph above what struck me was the amount of advertising in the vicinity and how easy it actually must be not to notice the charity stand. Some years ago one of the arts groups in Galway devised a project where writers sat in a shop window, Charlie Byrne's secondhand bookshop I seem to remember, for a week in turns and had to write poetry driven by the experience. I'm not sure if anything poetic will come out of my charity day but I kept wondering what was in every shopping bag, what the relationship between people was, who bought what and why. One thing that struck me was the number of parents with children who stopped, gave some money to each child and told them to put it in the collection boxes. Something nice and reassuring about that.